A leisure tour, designed to introduce you to a wealth of beautiful high mountain plants, many of which endemic to the Balkan region. We will explore the Vitosha Nature Park, the Rila and the Pirin National Parks and the Western Rhodope Mountains. Our tour starts in the Vitosha Mountain Nature Park with its variety of habitats – sub-alpine shrubs and grasslands, natural coniferous forests with alpine meadows, peat lands and rocky biotopes. The Vitosha Nature Park is a home to a variety of wildlife, including 1500 species of higher plants, 31 species of which are Balkan endemics. Some of the key plant species to be seen there: Lilium jankae, Lilium martagon, Geum coccineum, Jovibarba heuffelii, Senecio pancicii, Dactylorhiza saccifera, Gentiana lutea, Gentiana asclepiadea, Dianthus superbus, Silene roemerii, Cirsium appendiculatum, Cirsium heterotrychum, Heracleum verticillatum, Pinguicula balcanica, Dactylorhiza cordigera, Bruckentalia spiculifolia, Viola dacica, etc. The next four days are dedicated to the Rila Mountain. The Rila is the highest mountain on the Balkan peninsula. More than 200 lakes sparkle amidst the alpine meadows and rocky screes, giving birth to some of the biggest rivers on the Balkans. For six months of the year thick snow covers the mountain’s alpine share and the heavy ice bounding the lakes reigns long after the arrival of spring. Then comes the time of rare and beautiful mountain flowers like Aquilegia aurea and Geum bulgaricum, the blue blossoms of Gentiana pyrenaica, the dark-pink of the heavenly Primula deorum, a local endemic, and many more rare or localized flower species. In the coniferous forests, subalpine grasslands and rocky areas in the Rila National Park we will try to find Dianthus microlepis, Leontodon rilaense, Jasione bulgarica, Jasione laevis ssp. orbiculata, Potentilla haynaldiana, Saxifraga pedemontana, etc. In the lowlands, on our way to the Rila we will explore dry grasslands, shrub communities and secondary forests of Quercus pubescens and Carpinus orientalis holding Jurinea consanguinea, Centaurea immanuelis-loewi, Centaurea salonitana, Allium albidum, Anthylis aurea, Scabiosa argentea, Scabiosa triniifolia, Hypericum rumeliacum, Digitalis lanata, Micromeria cristata, Edraianthus serbicus, etc. On one of this days we will visit the famous Rila Monastery, the second biggest monastic complex on the Balkans, dating from the 10th century and listed as a UNESCO cultural heritage site. We will move on to the Pirin Mountain and will stay in the area for two days. The mountain’s astonishing nature is included in the borders of the Pirin National Park. The Park’s relief is of strongly expressed alpine character. Emerald glacier lakes reflect the surrounding peaks and sharp crests. Enormous spruce and white fir forests, thick pine-scrub formations and vast mountain meadows spread below. Some of the Macedonian pine trees (Pinus heldreichii) in the Park are more than 1000 years old. We will explore the forests of Pinus heldreichii and Pinus peuce, subalpine grasslands and rocky biotops in Pirin Mountains, where we will look for: Verbascum davidoffii, Daphne oleoides, Campanula velebitica, Arenaria pirinica, Erysimum drenovskii, Brassica jordanoffii, Saxifraga luteo-viridis, Saxifraga sempervivum, Arabis ferdinandiicoburgii,Veronica kellererii, Papaver degenii, Viola grisebachiana, Viola perinensis, Oxytropis urumovii, Leontopodium alpinum, Galium stojanovii, Dryas octopetala, Salix reticulata, Gymnadenia frivaldii, Onobrychis pindicola, Aubrieta inttermedia, Saponaria bellidioides, etc. Finally we will visit the Western Rhodope Mountains. Compared to the previous two mountains it is lower, with milder climate and rounded, pine-clad hills, occasionally cut by streams and rivers winding through deep gorges. Over 2000 species of plants have been recorded there, 90 of which are endemic to the Balkans. In the northwestern part of the mountain we expect to find Campanula lanata, Sempervivum erythraeum, Armeria rumelica, Onosma aucherana, Geum rhodopaeum, Astragalus centralpinus, Linum capitatum, Viola rhodopaea, Dianthus deltoides, Dactylorhiza baumanniana, Campanula sparsa, Carduus kerneri, etc. Then we will dedicate a day to region of the Trigrad gorge, looking for Abies borisii-regis, Haberlea rhodopensis, Morina persica, Sideritis scardica, Scabiosa rhodopensis, Arenaria rhodopaea, Micromeria cristata, Petkovia orphanidea, Trachelium rumelianum, Hypericum montbretii, Secale rhodopaeum, etc. In the region of the picturesque Smolyan lakes, surrounded by rounded, pine-wood slopes, we will be looking for Menyanthes trifoliata, Utricularia sp., Equisetum fluviatilis, Betonica officinalis, Potamogeton natans, Carex rostrata, Sparganium emersum, etc. 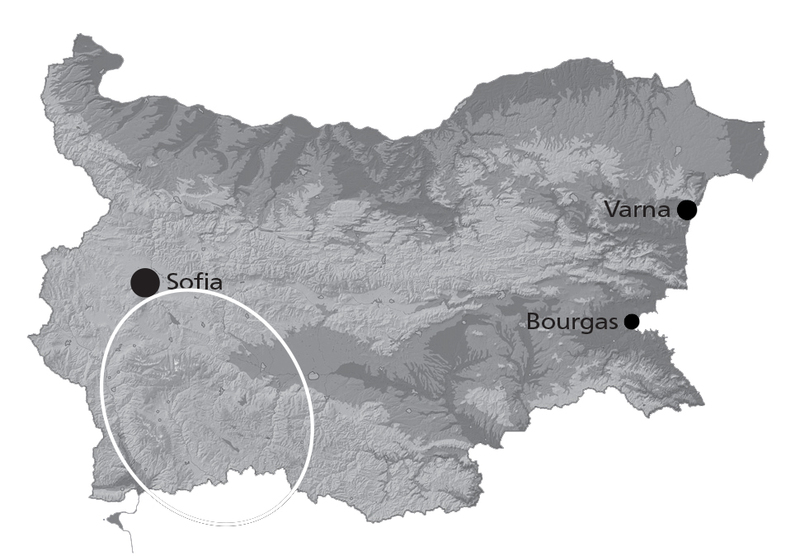 Then we will explore the northern share of the mountain for Gentianella bulgarica, Digitalis viridiflora, Silene saxifraga, Gentiana cruciata, Silene asterias, Silene velenovskyi, Onosma rhodopaea, Marrubium frivaldskyanum, Campanula glomerata, Coeloglossum viride, Lychnis coronaria, Lilium martagon, Dianthus cruentus ssp. turcicus, Aquilegia nigrescens, etc. While in the region, we will spend a day for sightseeing and delve into the region’s cultural aspects by visiting the Bachkovo Monastery and Assenova fortress. Yet, we will keep an open eye for Pistacia terebinthus, Seseli rhodopaeum, Achillea clypeolata, Centaurea salonitana, Inula aschersoniana, Jasminum fruticans and Colutea arborescens.